The shooting sheep from peasant memory, we've never seen that before! In all the pastures around, sheep dogs are barking, sheep are running in all directions, and shepherds no longer know where to give their heads to preserve their beloved plot, the one where they can put their sheep. Sheep warfare is a tactical game for both young and old. Be careful, your observation and anticipation skills will be put to the test! 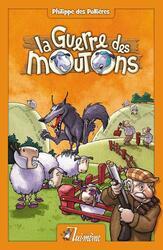 La Guerre des moutons is a game cleverly pinned down by Philippe des Pallières, nicely illustrated by François Bruel. He was named Game of the Year in 2002. Contents of the box : 1 large bag, 77 pawns/dominoes, 1 rule booklet.